Shadow Creek is a comfortably beautiful place to come home to after a busy day out exploring and making the most of the region. Enjoy the double fireplace opening to both the living room and the bedroom with fine linens and a luxuriously comfortable king size bed. A modern kitchen is provisioned with fresh and wholesome local produce from the region and a vintec wine fridge busy keeping some locally sourced wine and craft beer chilled for you. We have a lovely large outdoor deck, perfect for popping your feet up and enjoying a quiet wine after a day at the local farmers markets, walking along our famous beaches and perhaps visiting one of the 80 local cellar doors. Best of all, experience the luxury of privacy. You are the the only guests on the property. We also offer a Short break Babymoon package. 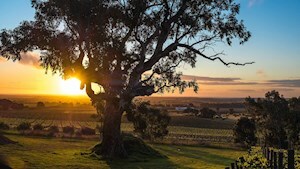 Find out more about our McLaren Vale luxury accommodation here. Shadow Creek is a one bedroom private, luxurious hideaway overlooking our McLaren Vale vineyard with stunning views from every room. 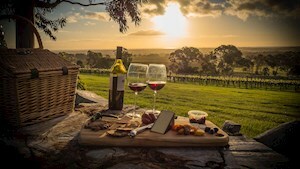 Only 40 minutes from Adelaide, the McLaren Vale region opens into a breathtaking sweeping view of the vineyards as you come over the hill. Experience some of our favourite wineries, restaurants and art galleries. The vineyard was established in 1998 in the foothills of McLaren Vale with four hectares of Shiraz in well-drained, low-vigour clay loams. 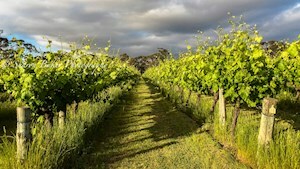 The rich, red gum country is on the side of the Willunga escarpment, is 55-60 m above sea level. To book Shadow Creek please call us or fill out the contact form below and we will be in touch.